The focus of this research is to investigate the history of the Goli Family Music Cabinet, making use of the music cabinet’s own biography to tell its story. The object is a piece of furniture associated not only with music but also strongly connected with religious manifestations, highlighting these components as vital cultural expressions of the community identity. This analysis will consider aspects of local traditions and immigrant activities, social life and material culture of the Norwegian-American people established in Dane County, Wisconsin in the late Nineteenth century . placing the object into context through the biography of its makers and owner. This investigation contemplates aspects of local traditions and immigrant activities, with the purpose of placing the object into context. Some aspects of this research comprehend information that were assumed about the decorative techniques applied to the music cabinet. Later, searching for more information and resources, it is now known that one decorative technique explored here is not present in the object in study. The research will maintain this section due to it’s relevance in Norwegian decorative arts. According to the Wisconsin Decorative Arts Database the Goli Family music cabinet is constructed of bird’s-eye maple , has a curved backboard and sides and an arched apron. The object’s exterior is painted in yellow-mustard color that could be milk paint , particular to early paint technologies. 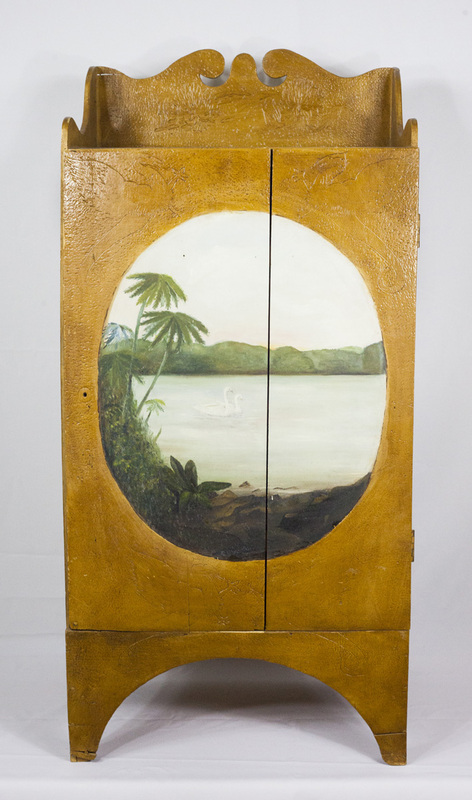 This rather plain surface ornamented with traditional pigments created a simple backdrop to a later striking painted design, the oval vignette that depicts a tropical landscape with a couple of swans, birds that represent love, on a lake with mountains and palm trees . 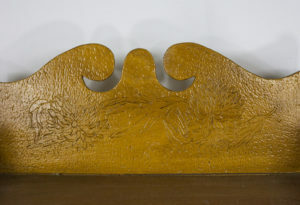 The upper front corners, backboard and sides are ornamented with finely incised dragons and flowers using a traditional Norwegian decorative technique known as kolrosing. The wooden interior of the cabinet is unfinished and there are three internal shelves that fit with standard music sheets. An original pull to open the cabinet door and a lock to secure the music inside are now missing. Many interpretations are possible since few records of the object exist. Another important question that can be raised about this object is why the door is divided in two parts, where there is a decentralized slot. Investigating reasons for this execution detail, came across the possibility that the music cabinet construction wood was the same used to make the cheese molds from the Goli-Berg cheese factory, or scrap or reclaimed wood. Analyzing the decorative elements that make this piece so unique it is possible to identify different aspects of the Norwegian culture and other universal iconography and influences associated. The joyful and vivid hue of yellow of the music cabinet was very popular in this period  but this striking surface color obscured earlier shallow wood carving* details. Kolrosing is a decorative technique that is constantly used on objects made of wood, bone or horn. The pattern is scribed into the object with a knife tip, and then the artist rubs on a dye that adheres to the etched lines so that the lines are clearly visible. The name Kolrosing (pronounced “coal-rose-ing”) reflects the fact that previously used coal mixed with animal fat as a dye. Kolrosing has been used broadly in Norwegian folk art as decoration on spoons, caskets and other utilitarian objects. Basswood and birch are the two most common woods for kolrosing. Unlike woodcarving, this technique does not remove wood; rather, a tiny groove is made by making a single shallow cut just deep enough to score the wood. Kolrosing is a Scandinavian tradition, dating back to Viking times when the designs were more geometric or “Celtic” in origin. In the Telemark  area of Norway, kolrosing designs show the influence of rococo design translated into flower, leaf, and vine forms. *At the beginning of this research these shallow wood caving details were identified as Kolrosing that received a layer of paint, but after looking for more information and resources it is now accepted that the lines were merely incised in wood, not being a representation of the technique known as Kolrosing, that was deeply analyzed in this paper. The kolrosing of the music cabinet ornaments are compound by dragons and floral motifs and also an oval boundary line in the center of the music cabinet’s door. Since the cabinet received a coat color paint over the incised details, the contrast between the lines filled with coal and oil and the color of the wood are no longer visible. This overpainting of earlier kolrosing could mean and attempt to update and make the cabinet more fashionable or modern, and, considering the aesthetics of the shape of the curves of the arched back of the music cabinet we can also perceive an attempt to recreate the Victorian furniture artistic features. The combination of all the decorative elements of this object make it n unique piece with the compilation of eclectic decorative approaches. The techniques used and details applied seem to mismatch, but since this music cabinet is a collaborative piece, these singular elements appear to be more independent and spontaneously generated between the three makers. Each maker worked in a different stage of the process and it doesn’t seem like the cabinet had a design planning or an agreement among the people involved. It is possible that Erick Goli, the man responsible for the construction just focused in the functional part and the household women decorated the surface, as a resource of improvement of the rudimental appearance of the piece . This structure was a quite gendered of aspect of home craft. Analyzing the aesthetics as a whole, the Music Cabinet is not exactly what you expect from a Norwegian inspired piece of furniture. The Goli family music cabinet is not very appealing as a form of aesthetics but it has a naïve charm and individual expressiveness. 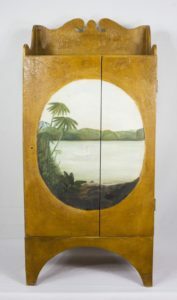 Nonetheless this traditional Norwegian decorative technique is not the focal point of the music cabinet The object’s dramatic centerpiece is the oval landscape vignette depicting two swans on a lake surrounded by mountains and palm trees. This element surprises as it is nothing like either Norwegian or Wisconsin landscapes. Such a depiction is surprising (why?) This could be interpreted as an attempt to express Escapism, maybe associated with homesickness or seasonal affective disorder . Four dragon figures surround this medallion painting, in the four corners of the music cabinet’s door. These dragons with long and sharp serpent tails are incised in the wood using the kolrosing technique. These intriguing elements make contrast with the delicate look of the landscape painting that it surrounds. The word dragon itself can be traced to a Greek word, drakon. It means "sharp-sighted one", "serpent", "one with a deadly glance", "to see", "look at". In Latin, the Greek word was converted to draco, and it came to mean "giant snake" and the Romans shared this belief as well. 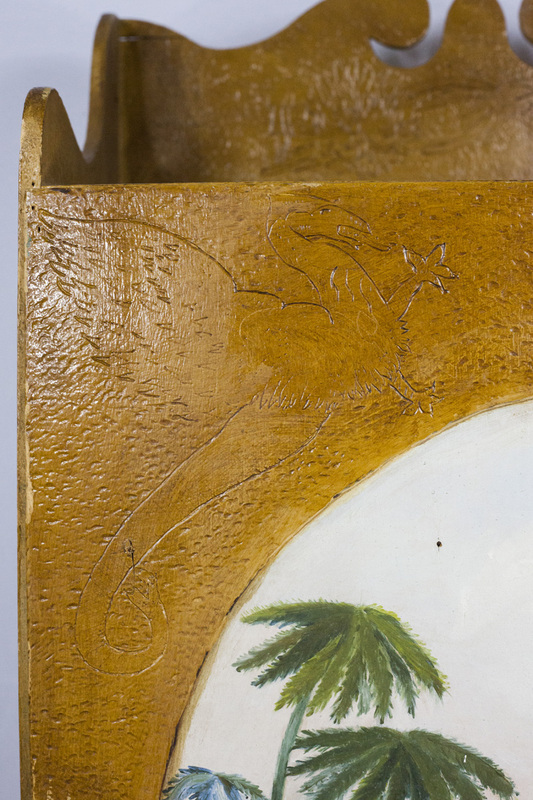 This dragon-serpent-like with wings match the figures incised in the wood of the Goli family music cabinet. Dragons are important to multiple ancient peoples. The Celts, for example, showed great reverence for dragons and serpents, depicting them by the side of their gods. They came to represent wisdom and nobility, sovereignty. In Celtic and Teutonic societies dragons and serpents are often viewed as guardians of sacred places, treasures and precious sepulchral items as in Greek mythology . The Norwegian dragon-snake called the lindwurm is a dreadful creature and knowing the significance of this symbol, its presence on the music cabinet’s door is coherent: music sheets can be considered precious goods. The floral elements in this piece (added with the same kolrosing technique) are stylized therefore no specific plant is clearly identifiable but, if compared to Rosemaling floral styles it could be representing acanthus leaves and flowers . The farm houses decorations were done in the same style as they did across the sea. Buildings followed traditional architectural designs, some of them with dragons at the peaks of the gables and shingles were shaped to resemble fish scales. The decorations in cupboards were elaborate and rosemaling was typical and colorful. The three-leg chair (bandestool) fit well in the corners and balanced in uneven floors. All woodwork, including furniture was elaborately carved or turned and the mythical motifs were also employed. Norwegian traditional furniture is highly decorative. The Norwegian immigrants brought their native costumes to the new land, perpetrating the craft of the old country. A blend of carving and flamboyant painted decorations was attractive and practical and the works of the Wisconsin settlers was distinct comparing the Minnesota area, one of the reasons is that Per Lysne, born in, Norway, immigrated to Stoughton, Wisconsin with his wife in 1907. He had been trained in rosemaling by Anders Olsen, an artist whose work was recognized at the Exposition Universelle at Paris in 1893. Lysne had specialized in redecorating antique chests and painting large platters. He developed a thriving rosemaling enterprise and taught the art to a select few. Comparing the music cabinet to similar objects, is possible to distinguish by the level of craftsmanship some elements that reinforce the status of folk art of the Goli Family music cabinet. The object below, documented by the Wisconsin Decorative Arts Database, is a music cabinet attributed to Helge Alfred Borreson  from La Crosse, Wisconsin, dated 1872-1880,. From the pictures, it’s possible to identify the a much higher level of craftsmanship concerning wood carving and fine decorative elements with impressive professionalism. The Goli music cabinet was created more than twenty years later by amateur people. Perhaps, the time worked as a factor of change, resulting in an adaptation to the American taste and aesthetics keeping its Norwegian roots. Overall, Norwegian-American furniture is, cheerful, inventive, and picturesque and that is a word that describes very well the Goli Music cabinet . Among the more than 900.000 Norwegian immigrants, ?? ?artists came to the United States bringing with them tools, art supplies and the art of Rosemaling to the United States. They came with beautiful decorated and painted chests, very distinct and rich in detail. With this early establishment, the artists were able to keep producing good work. Some adaptations surely were made, but many objects from that period kept the authenticity of Norwegian folk art. It was common to maintain the tradition alive by passing knowledge to relatives and apprentices, both to keep the heritage present in their daily life and to have a source of income . Rosemaling experienced its revival in America in the 20th century. Norwegian-Americans became interested in the Rosemaling decorated possessions of their ancestors and then American Rosemaling began to develop and flourish. The revival of Rosemaling in the United States is often credited to Per Lysne who was born in Norway and trained in the craft. He came to America in the early 20th Century and was employed as a wagon painter in Stoughton, Wisconsin. When business slowed during the Great Depression, he began Rosemaling again. Today Norwegian Rosemaling is taught in many areas of the USA. Rosemaling associations sponsor classes and competitions. Beyond the professional artistic practice, there was a group formed especially by women that were taught since childhood to practice needlework and other feminine associated handwork. This was a habit embedded in the traditional familiar structure where the woman is the mother, the wife, the housekeeper and eventually an artist. Magazines with crafts and “how to do” sections inspired many women in artistic ways, improving the household, the domestic life and making good use of their time. These magazines were available, but not financially accessible to all. Ethnicity, nationalism and heritage were clearly perceived in the artistic production, craft and folk art. The respect with the past and the attempt to connect to their ancestors brings emotional attachment and sentimentality. The sense of preservation had profound meaning and showed respect to their culture. The original maker of the music cabinet was Erick Goli  The 1900 federal census for the Town of Perry, Dane County , born in 1841.In 1866 he married Ragnhild Skartum (1846-1926) and they started a business in a farm and Cheese Factory called Goli-Berg Cheese Factory. The factory belonged to the family for seventy years and then was sold. Later, it was called Drammen Valley, the name of the road where the farm was located. According to the records of the Mt. Horeb Area Historical Society, this music cabinet was constructed by Erick Goli between 1900 and 1920 for his daughter Kristine Goli (1886-1985), by that time, a piano apprentice. His other daughter Margrethe Goli (1883-1971), the second maker of the object, was a pianist at the Perry Lutheran Church. She was the one responsible for adding more adornments and details to the piece, using traditional wood decorations techniques. . The third maker of the music cabinet was also a member of the family. Amanda Goli, sister in law of Kristine was married to Martin Goli, Kristine’s older brother. She painted the central element of the cabinet inside the oval korolsing shape done by Margrethe. The way the music cabinet was made suggests that the object evolved, taking a few months (or years) to be completed. There is not known chronology of the process of making steps, but that was a representative example of Norwegian families’ tradition of producing arts and crafts: men were makers and the women decorators . The Goli family women were dedicated to needlework (such as quilting and stitching), and music as MHHS records indicate. There are examples of needlework and quilts done by the Goli women including Kristine Goli, the music cabinet owner. Kristine Olava Goli born in Daleyville in July 26,1886, was an important member of the Mount Horeb area community. She was a piano teacher, church organist for 69 years and the director of the Perry Lutheran Church choir. Kristine learned piano since she was young. Her father Erick always encouraged his daughters to study music, indicating a family passion. He took the girls, weekly, in a 16-mile round trip to Blanchardville to take lessons from Mattie Holland. Kristine also came to Madison to study more music . The music cabinet stored her music sheets and it was placed next to her piano  in her own house in Dayleyville. In 1911 she started taking pipe organ lessons in Milwaukee because the church acquired a pipe organ and no one else knew how to play it. She became the organist and choir leader from 1906 until 1973. She also worked at the organization Ladies Aid and Dorcas’ office. For her personal life, Kristine never married. She used to say she never had the time for it and one of the possible reasons for that was because she had a brother, Karl Adolph with very fragile health, suffering from physical disabilities and partial blindness. She devoted her life to taking care of him (they shared a house ) and serving the church . She resigned her work in the ministry of music at Perry Lutheran Church at the age of 88, in 1974. Nonetheless, she continued to play piano as a volunteer in nursing homes. and quilting. At this point, she was living on a Nursing Home. In the 29th of July of 1959 the Church held the “Kristine Goli Day” at Perry’s with a special dinner, in honor of her many years of service. She died in February 21 in 1985, at 98 years’ old. Her long life encapsulated a series of circumstances such as happiness, faith, fulfillment and good health. Music was always important in her life, but when she was no longer serving at the church her devotion transitioned to serving the elderly bringing the joy of her presence and her music to nursing homes. This new path possibly changed the mode of the music she played. At young age, Kristine lived at her parents’ house, at the farmstead in a beautiful and distinct example of the local Norwegian American Architecture. In 1945 she moved to Daleyville. The architecture expression at the rural area of Mount Horeb was very dynamic and many different styles were noticeable. Ethnic background, type of products produced by the farms and wealth were among the factors that explain that diversity. This house has distinct ornaments typical of Norwegian patterns and bye the fashionable style of the house it’s possible to assume that at this point the Goli family was wealthy. Eileen Hanneman, one of the living relatives of the Goli Family, in a in person conversation, said that unfortunately she was too young to remember her great aunt Kristine Goli in details. Her mother Selma was Kristine’s younger sister and they were close friends. Eileen doesn’t have any visual remembrance of the music cabinet but she shared some memories in common with Rachel Faldet, a little girl that Kristine used to baby sit. She was a daughter of one of Perry Lutheran Church’s preacher, Paul Andersen. They both remember the presence of Kristine’s’ brother Adolph in the house. They described him as a shadowy figure, always wearing sunglasses and a cane . Rachel was one of Kristine’s best friends and was always visiting her, brought by her mother Sarah whom was working at the church. Rachel has no recollection of Kristine’s music cabinet either. She said that the room where the piano was placed was dark. Kristine kept the rooms in a semi-darkness lightning, to not disturb her brother’s eyes. This ambiance probably affected the visual recognition of the music cabinet by the living witnesses of the object’s life. The upper Midwest was at this point a European cultural melting pot. Geographically, the resemblance to the topography and the climate of Norway made them feel almost like home but religion and music were two fundamental elements to gather people. This helped them reinforce bonds between folks sharing the radical change of embracing a new beginning a new life experience. Immigrant transition into broader American culture was quite difficult . Music worked as an element of integration associated with joy and nostalgia. In the beginning, at Perry church the services were held in Norwegian, and the people only spoke in their mother language. Mount Horeb was an isolated town and this geographic particularity sustained the community to grow with a strong connection to their customs. To create this sense of unity was a pathway to keep alive habits from their home, minimizing the effects of the cultural shock of immigration. Erick Goli, the music cabinet first maker was a Trustee of Perry Lutheran Church for five years and a Deacon for fifteen. All the family was engaged with the Congregation and following in her sister Margrethe’s footsteps, Kristine started playing piano at Perry’s Lutheran Church in 1906, she was 15 years old. There is a cassette tape  with some music played by Kristine found at the archives of Mount Horeb Historical Society. She played the Hymns at Perry, she played in almost all wedding ceremonies in town. At her free time, she played classical music but it is not possible to say that she was also a composer. Rachel Faldet, in a phone interview, also said that Kristine taught her simple notes, sitting side by side with her at the piano at home and even at the church. There is no record of what happened with her personal piano and music sheets after her death. Despite all her busy schedule serving the Perry Lutheran Congregation, Kristine was an enthusiastic and energetic lady. She used to ride her car and was very proud of her freedom to come and go. She was a very independent woman, considering the time. According to several local newspaper articles, Kristine was joyful, energetic and appeared to be younger than she was. She considered herself healthy and blessed. In her free time, she loved to cook and bake and she was famous for her beautiful quilts. She was very dedicated with her needlework. As a quilter, Kristine was proud of her needle work and frequently was celebrated by her talented production, according to local newspapers. For her, quilting was more than a hobby, it was a passion. Her position in the community reflects how women’s role in the society was an element of union and strength. The images below are newspaper clips where Kristine is shown as a very active representative of the society. She used to volunteer playing and quilting in nursing homes and other organizations. The music cabinet can be considered a good example of Norwegian-American folk art due to its unique characteristics and collaborative process of making. Despite the simplicity of the final product, the piece has a great background story and a very rich biography. The Goli Family represents well the typical Norwegian-American family in community life and their traditions, such as the significance of cultural and religious manifestations. This peculiar object carries a lot of history and tells us how the immigrant and their descendants lived in the Mount Horeb area. The Goli music cabinet was made by non-professional craftsman and represent a specific “era” in the regional folk art category, validating amateur work as a way to preserve the identity of a community by the mechanisms and context of the production of folk art. Thanks to The Mount Horeb Area Historical Society and their passionate curators and volunteers Destinee Udelhoven, Johnna L. Buysse, and Brian Bigler. Thanks to Eileen Hanneman, Rachel Faldet and Kristin Brue for the wonderful histories shared. To Ann Smart Martin for the precious time and consideration contributing to the success of this research. Object’s visual characteristics suggest that the object is made from cheap lumber and not Bird’s eye maple, which is a noble wood. Deep analysis of the material is recommended to help identify wood and paint types and approximate dates. External paint is not mentioned on the Wisconsin Decorative Arts Database . The experimental watercolor Indian Yellow—a fluorescent paint derived from the urine of mango-fed cows was very popular in the nineteenth century, especially among artists like William Turner, Paul Gauguin and Vincent van Gogh that thought the color brought warmth to the soul. The Telemark county is located in southeastern Norway, extending from Hardangervidda to the Skagerrak coast and it has a very broken and heterogeneous landscape, including many hills and valleys. The acanthus is one of the most common plants to make foliage ornament and decoration 23 , especially in Norwegian folk art, found in Rosemaling Paintings and wood carving. Music cabinet owned by the Vesterheim Norwegian-American Museum in Decorah, Iowa. According to the 1900 federal census for the Town of Perry, Dane County . Eric Goli, born in 1841, emigrated from Norway with his parents Frederick (1811-1901) and Margrethe (1801-1875) to Wisconsin, at the age of ten. The Mount Horeb Historical Society has records of her piano cover, quilted by to a third party. The content of the tape is available on this ebook. The music cabinet was donated by Frederick and Lorraine Hanneman They were responsible for Kristine’s belongings. The piano cover, quilted by another woman is available at MHHS. Other needlework attributed to Kristine’s mother is part of the MHHS registry. Creators, Collectors & Communities by by Larissa Cangussa is licensed under a Creative Commons Attribution 4.0 International License, except where otherwise noted.